One of the newest projects in KC music is Redder Moon, our Artist on Trial today. The band, essentially a dual collaboration between Jeremiah James Gonzales and Matthew Naquin (they also recently added Jon VanSickle as a live drummer), blurs the lines of electronic, avant garde, and psychedelic shoegaze sounds. 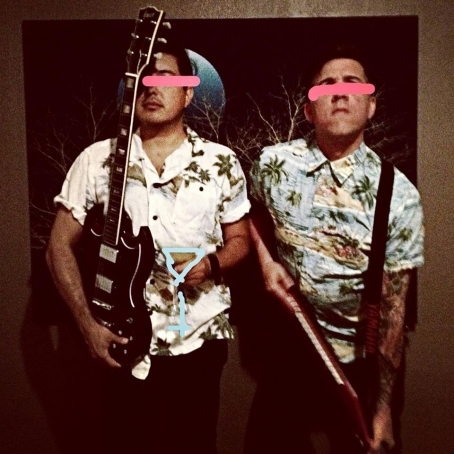 We talked with Gonzales a bit about Redder Moon and what they have planned for 2015. The Deli: Down and dirty: one sentence to describe your music. Gonzales: Sounds like the soundtrack to a post apocalyptic film that has not yet been made. The Deli: Who writes the music? Gonzales: I come up with the big picture of the songs for the most part, and then Matt helps translate the idea into digital ear candy. At times, he adds some of the most essential elements that cap off the big picture and make it better. The Deli: What inspires your songwriting? Gonzales: I am mostly inspired by movie soundtracks and the feeling I get when I’m in engulfed in a great film, alongside being influenced by the need to express ourselves, as are most creative people. I also cite pizza (the food) as an influence. The Deli: What have been your greatest accomplishments as a band? Gonzales: The day we finished production of the first record, a small EDM outfit from Canada called Upstairs Recordings wanted to put out or EP digitally, so that was pretty cool. Also, Matt Hill of UMBERTO has made a few remixes of some songs and as a result, a pretty cool label Not Not Fun Records (LA) will possibly be putting something out for us sometime in 2015. The Deli: Do you have any plans to record a new album anytime soon? Gonzales: I’m currently compiling/accumulating songs for the possible NNF release. However, we are always open to releasing digital tracks/albums intermittently and physically with the right pairing of record label. The Deli: You've been making music in Kansas City for a long time. What's your goal with Redder Moon compared with bands you've been with in the past? Gonzales: Over the years I've had the pleasure and experience to be in some very great bands with some very talented people. I would say that I'm very lucky to have been able to be a part of the music scene over the years. But with playing in traditional bands comes all the traditional woes and throes of juggling multiple schedules/tastes/personalities. I never really set out to do anything specific with Redder Moon. In fact, I was somewhat satisfied with a musical hibernation, so to speak, when Matt convinced my return from slumber. We have also found that playing in a duo breeds less stress on the overall quality of our creative lives. The Deli: What does supporting local music mean to you? Gonzales: I try my best to support local music in as much of a non-biased opinion as possibly allowed. Meaning, I can ALWAYS appreciate the guts that it takes to put original music out into the world, be it live or on a recording. I am constantly battling with myself on whether I think our stuff is good enough to put in front of people or if I will only scar the listeners’ ears forever. That said, I know exactly what it means to put together a band/project and the vulnerability one must go through to do it. So I do my best to find the good in everyone's unique take on their art and have learned to grow from constructive criticism toward my own. The Deli: Who are your favorite local musicians right now? Gonzales: I have also been in somewhat of a slumber in the local music scene that I’ve been reawakened to as of late, so I have yet to experience some of the newer acts emerging in the KC scene. Some of the few I have kept up with are Organized Crimes, Scammers, ISAM, Expo 70, Mat Shoare Band, and C.S. Luxem. I know there are plenty of local bands that I have yet to hear or older bands that have released new material and I can only look forward to experiencing the sounds to find out for myself. The Deli: Who are your favorite non-local musicians right now? Gonzales:Steve Moore, megafortress, Lansing/Drieden, gayngs, Xander Harris. The Deli: A music-themed Mount Rushmore. What four faces are you putting up there and why? Gonzales: Bernard Sumner, Robert Smith, Gonzales Hetfield (early years of course) and Klaus Schulze. The Deli: Where can we find you on the web? The Deli: Always go out on a high note. Any last words of wisdom for the Deli audience? Gonzales: Recycle plastic and always get your pet spayed or neutered. Also, may all your ups and downs in life be between the sheets. Get down to Replay Lounge this Friday, January 30. Redder Moon will be performing on a psychedelic bill with CS Luxem and No Cave. Facebook event page. Michelle Bacon is editor of The Deli KC and plays in bands.